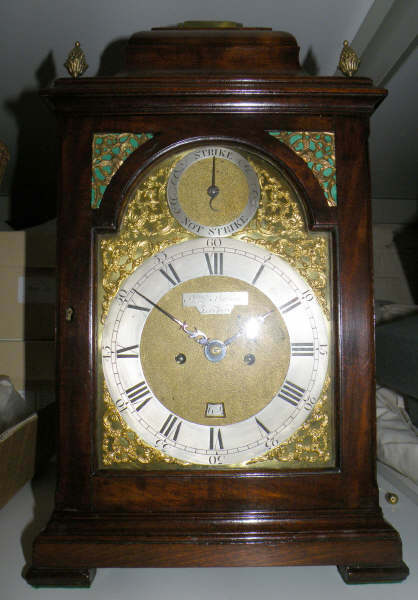 This clock has one of the plainer dials and cases in the house, and is sometimes overlooked in favour of some of the more exotic clocks. 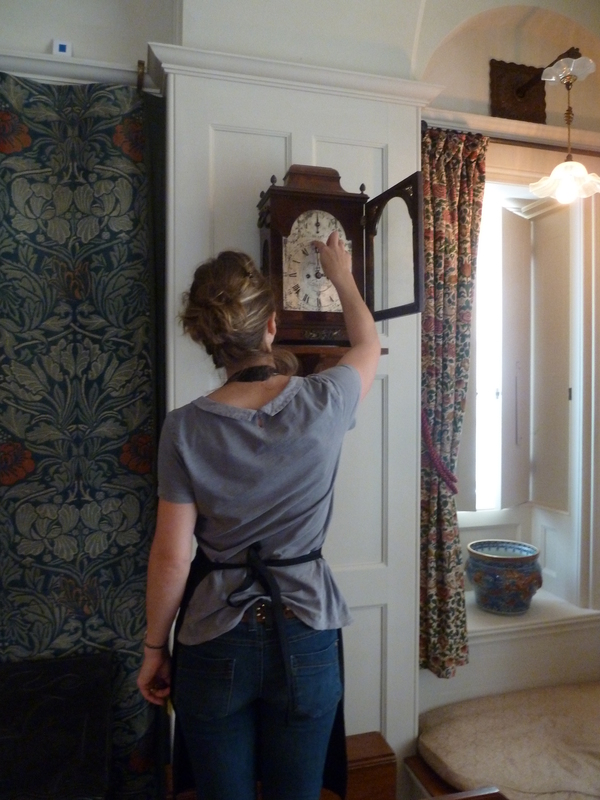 It does have some interesting hidden features though and after getting some more information from the clock conservator at the recent conservation weekend, it seemed like the perfect time to share them. The clock is on the wall in the kitchen and was in the house when the National Trust took over following the death of Helen Beale in 1972. It was made in about 1920 and has a plain, white dial and blued steel hands, which makes it very easy to tell the time accurately. Inside the mahogany case there is an eight day movement, which means that the clock only needs to be wound once a week. Caroline, one of the conservation assistants, still winds it every Tuesday and it still keeps good time – it hasn’t been more than one minute out this year. The clock might not always have been in this room, but it would probably always have been in the servants’ quarters. It could have been used by the servants to set the other clocks at Standen as it’s likely it would have been the most accurate in the house. It has a very clever mechanism that means it could be corrected by telegraph from Greenwich at regular intervals – hourly, daily or weekly – if it was connected to the telegraph system and the subscription was paid. Inside the movement there is a horseshoe shaped section which allows an arm controlled by an electromagnet to drop in and centre the minute hand on the hour when it receives a signal. Standardisation and synchronisation of time were very important issues in the Victorian era. A reliable, common time was needed to help the growing railway network run efficiently – which would help Mr Beale to get to his London office on time. In 1884 the common reference point for global time became the meridian in Greenwich and so the signal would have come to the clock here at Standen from the Observatory there by way of the local Post Office or the commercial business The Standard Time Company. The ‘Greenwich Time Lady’ is probably more famous for selling time in London in the early 20th Century though. A lady called Ruth Belville would travel around with her old pocket watch nicknamed ‘Arnold,’ showing customers the accurate time she had set in Greenwich for a modest fee. Categories: collection | Tags: Clocks, collection, object, Objects in Focus, Showroom, Standen | Permalink. Hi, I’m Caroline, one of Standen’s part-time Conservation Assistants, helping with the daily, weekly and annual conservation tasks within the house. One of the first jobs I was introduced to was checking, winding and resetting the clocks. It’s one of the many routine weekly jobs which do not take too long, but you need to be mindful when handling each clock, especially looking for any changes which may affect the workings of each one. how many turns of the key the springs or weights need to keep the clock running. Any problems are reported to our Clock conservator, who comes to visit annually. As you can imagine, each clock has it’s own personality and it does not take long to know which clocks run slow and those that keep perfect time! 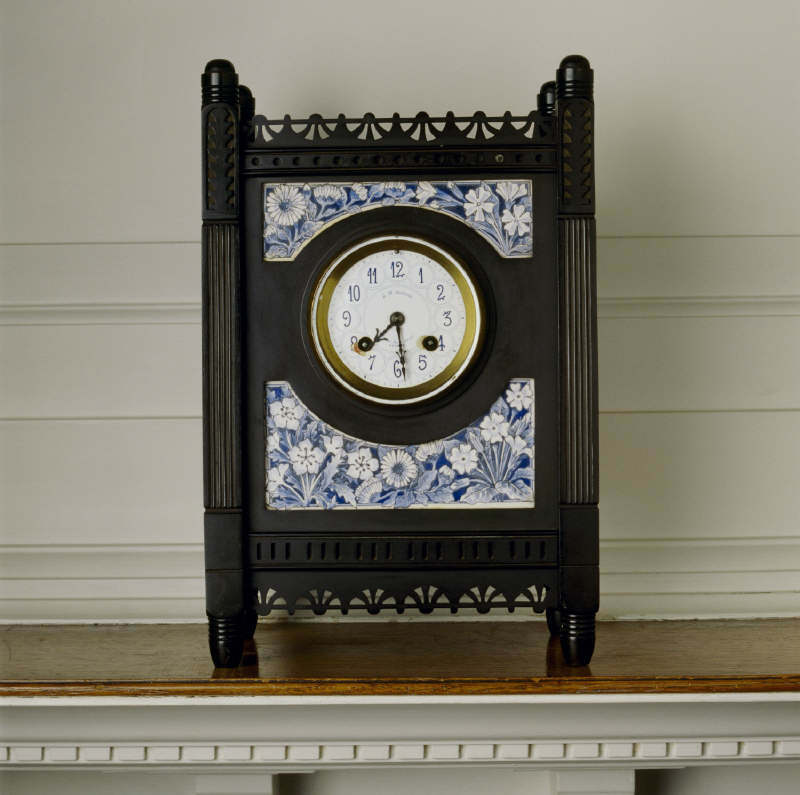 If I could take one home, it would be the Benjamin Bulline Table Clock (circa 1770) located in the stairwell. It’s an oriental design with beautiful ornamentation. Another clock I’m really fond of is the J. W. Benson clock which sits proudly above the fireplace in the Morning Room, due to its chimes. This clock always runs ahead of time so we need to reset the time by winding the hands forward, hence we get to hear its delightful charm! Whats your favorite clock in the House? Categories: Uncategorized | Tags: Arts & Crafts, Benjamin Bulline, Chimes, Clocks, collection, conservation, Conservation Assistant, Drawing Room, Historic house, House, House Team, J.W. Benson, Morning Room, National Trust, Routine, Stairwell, Standen, Winding | Permalink.